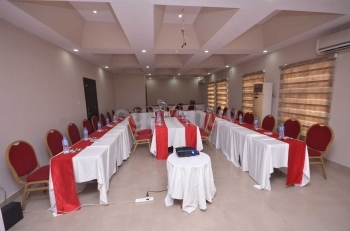 Suitable for all kinds of conferences, training and meetings for 100 guests (banquet). Q: What type of chairs does Parkview Astoria Hotel Conference Room 1 provide? Q: What type of tables does Parkview Astoria Hotel Conference Room 1 Provide? Q: Is there parking space at Parkview Astoria Hotel Conference Room 1? Q: What type of flooring does Parkview Astoria Hotel Conference Room 1 have? Q: Does Parkview Astoria Hotel Conference Room 1 provide security? Q: Does Parkview Astoria Hotel Conference Room 1 provide projector? Q: Does Parkview Astoria Hotel Conference Room 1 allow you bring in your food and drink? Q: Does Parkview Astoria Hotel Conference Room 1 provide power? There are no reviews for Parkview Astoria Hotel Conference Room 1 yet. Sorry, not available at Parkview Astoria Hotel Conference Room 1. Kindly check out other available dates or check out other venues in Ikoyi that match your requirements.